Members of Mothers Demand Action clad in bright red shirts watch the Judiciary Committee hearing. Supporters and opponents of two bills that would ban bump stocks and untraceable “ghost guns” packed a public hearing at the state Capitol complex Friday, testifying all day and into the night over the devices. Bump stocks allow semiautomatic rifles to fire at a rate similar to that of machine guns and were used by the Las Vegas shooter who killed 58 people and injured hundreds more last October. The bill also would ban trigger cranks and other rate-of-fire enhancements. Ghost guns are weapons assembled from kits and parts ordered online. Advocates in the crowded hearing room reacted with groans and claps to legislators’ questions and people’s testimony at different points of the hearing. 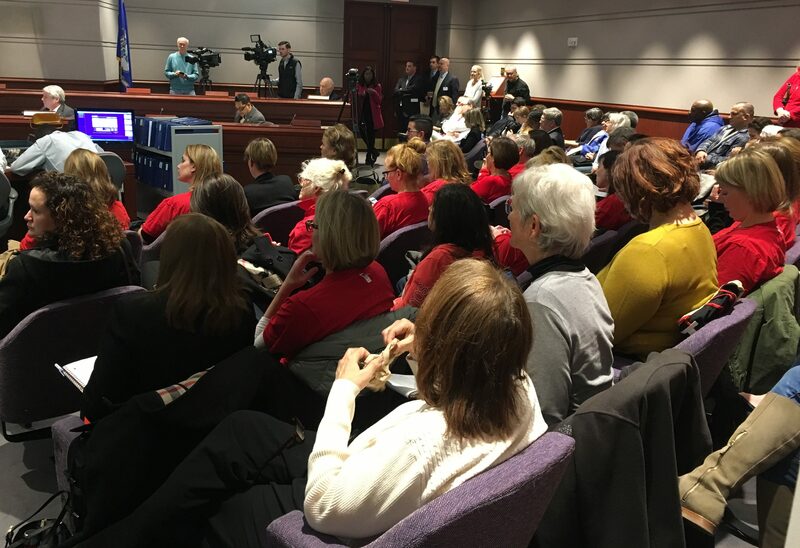 Members of Mothers Demand Action and Connecticut Against Gun Violence dressed in bright red and orange shirts respectively to emphasize their presence. Gov. Dannel P. Malloy released written testimony during the hearing reaffirming his support for the bump stock measure and stressing the importance of closing dangerous loopholes. Meanwhile, President Donald Trump tweeted Friday afternoon that the Department of Justice was issuing a proposed regulation banning bump stocks. Several states already have enacted or are considering their own bans. State Rep. Doug Dubitsky, R-Chaplin, repeatedly expressed concern that the bill banning ghost guns was vague and could incriminate people working with blocks of steel and machine tools at home. Backers of the measures pushed back, repeatedly stating the bills would prevent increasing the capability of deadly weapons and ensure people couldn’t purchase unregulated, untraceable guns. Ghost guns, they argued, were simply a workaround of the state’s existing gun laws. Melissa Kane, a Westport selectwoman, described a lockdown last month at the town’s Staples High School caused by a student who threatened a mass shooting. When asked by Dubitsky whether possessing a block of steel should be illegal, Kane remained steadfast. Others, like firearms instructor Brooke Cheney, were equally unwavering in opposing the measures. Cheney, a Harwinton resident, said the bill on ghost guns served no purpose and had unintended consequences. Cheney said some of her students are not able to shoot certain firearms because of arthritis, or their hands being too small, and they need to be able to modify their trigger. The public hearing was supplemented by clashes among more than 100 people who submitted written testimony on each of the measures. Po Murray, chairwoman of the Newtown Action Alliance, called bump stocks and similar accessories simply a way to get around federal law prohibiting possession of fully automatic weapons. Ghost guns, she wrote, circumvent the state gun laws passed after the killing of 26 students and six educators at Newtown’s Sandy Hook elementary school. “Ghost guns appeal to those who cannot legally purchase firearms,” she said. He said a criminal could purchase a bump stock out of state or even make one with a 3-D printer. “This bill wouldn’t impinge a criminal in any way and only interfere with honest sportsmen,” he wrote. Senate President Pro Tem Martin Looney, D-New Haven, released a statement expressing support for the bills, stating it is easy to obtain parts for a ghost gun from websites where AR-15 lower receivers, a critical part, can cost as little as $65.